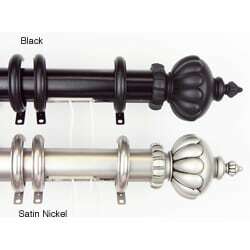 This center-open decorative Stately traverse rod is designed for use with pinch pleat draperies and includes 40 rings. With a high quality smooth traverse operation this rod will easily and elegantly update the look of any living space. "will these rods draw all the curtains to the left"
This rod opens your drapes in the middle and stacks on each side. "Does this product allow for a right draw? In other words, have the curtain stack only on the right side?" The drapery opens in the middle and stacks on each side. "I need extra rings for this rod. What are the clip rings that I would need to order? I need this asap for a party next weekend and need to hang new rods but don't have enough rings for pinch pleats"
I''m sorry, we do not sell extra rings for this rod separately.